Fishing and snorkeling combo trips. Fishing and snorkeling all in one trip private power boating charter caters to groups of 6 or less that want to experience both snorkeling and fishing in one trip. Go snorkeling on a coral reef, fishing in the backcountry and sight seeing along the way. Always calm and always a nice day. We help you live the dream and do many things on one trip. 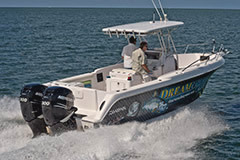 Dream Catcher Charters has been offering this activity since 1994. 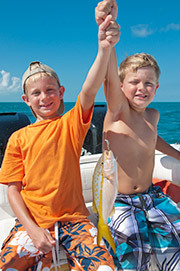 The most trusted name in boating and fishing charters in Key West. We supply all the gear and snorkeling instruction if needed. Avoid the crowds and enjoy a private setting with just you, the captain and nature in many different places we venture out to. We also offer Snorkeling charters Too! We supply the fishing gear for all sizes of fish that we catch. From 1 lb snappers to 300 lb sharks. Everyone catches fish and gets to be the hero. There are many fishing surprises throughout the trip; our job is to keep your rods bent and faces smiling. We pratice catch and release on all the fish except what you want for dinner. Along the way you never know what you might see. Turtles, Rays, Sharks, Dolphins and a huge variety of marine life. Our guides know who they are and lots of information to share about all of them. With fishing, snorkeling and sight seeing, this is the most complete boating charter available in Key West. To help match budgets and group size Dream Catcher Charters offers two different boats for this private charter. 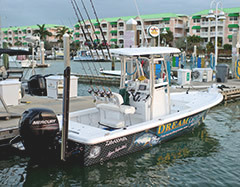 The versatility is amazing with this company to show you a great day on the water. The "Inspiration" has room for 6 or less. Enclosed bathroom, fresh water shower, shade, stereo and cooler with ice. The "Interseptor" Room for 4 or less. Enclosed bathroom, fresh water shower, shade, stereo and cooler with ice. We supply bottled waters, ice, Snorkeling gear mask, snorkel and fins for everyone. Wet suits for the cooler days, fishing gear and all licenses. All the bait you can feed to the fish, and instruction for any of our activities. A hat, Sunscreen and everyone has to wear sunglasses especially while we are fishing. Bring what you would like to eat or drink and adult beverages are fine. A towel would be a great idea and something to put on after being in the water on the cooler days to keep the chill down.